James Michael Aston was born on April 13, 1950 in Scurry, Kaufman County, Texas. He was a three year letterman on the varsity football team and a 1968 graduate of Wichita Falls High School. In January 1969, he was sent to the Republic of Vietnam where he was assigned to H Company, 2nd Battalion, 26th Marines as a Mortar Ammunition Man. On March 19, 1969, Private First Class Aston was participating in a company-sized operation through thick brush and chest high elephant grass in Quang Nam Province when he tripped a hidden enemy explosive device. Fully aware of the probable consequences of his daring action but thinking only of the welfare of several nearby companions, he unhesitatingly threw himself across the lethal object and was mortally wounded as he absorbed the concussion of the detonation. His heroic and timely actions inspired all who observed him and were instrumental in saving the lives of several Marines. Aston posthumously received the Navy Cross for his actions. He is buried in the Vashti Cemetery in Vashti, Texas. His name is inscribed on the Vietnam Veterans Memorial in Washington D.C. on Panel 29W, Line 75. Thomas Lee Blevins, Jr. was born on April 12, 1948 in Jersey City, New Jersey. He was assigned to C Company, 1st Battalion, 26th Marines as a Rifleman and Squad Leader. 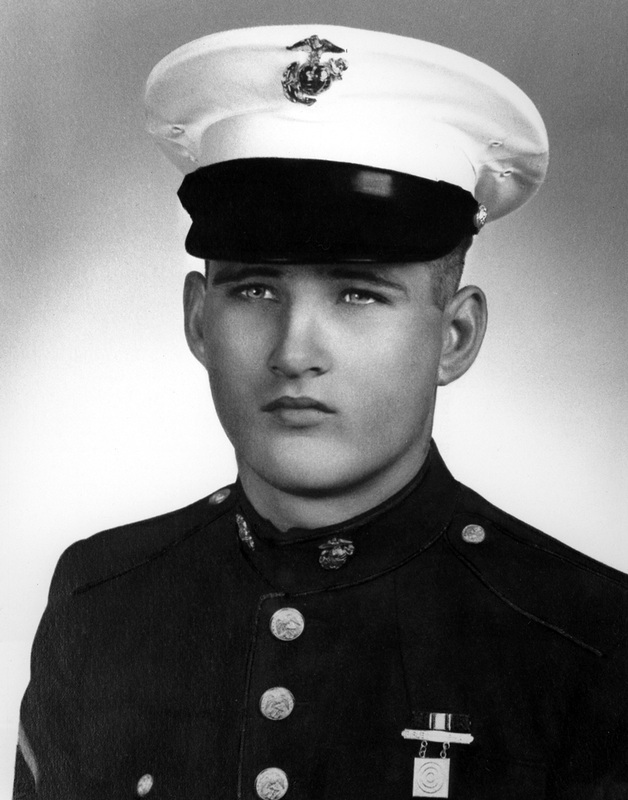 On May 31, 1969, while Corporal Blevins maneuvered his squad as the point element of a company-sized search and destroy operation in Quang Nam Province, the Marines came under a heavy volume of automatic weapons fire from a large enemy force occupying well-concealed, fortified emplacements. Observing that three of his men had been wounded and had fallen in an unprotected area close to the hostile positions, Corporal Blevins unhesitatingly left his relatively secure position and ran across the fire-swept terrain to the side of his companions. After kneeling in a dangerously exposed position to administer first aid to one of his men, he removed the man to waiting medical attention behind the friendly line. He then again braved the hostile fire raking the area and, after administering brief emergency treatment to the second wounded Marine, moved him back to the company's defensive perimeter. When he raced to the aid of the third man, they both became pinned down by concentrated enemy fire. Corporal Blevins, in full view of the enemy troops, hurled a hand grenade which diverted their attention sufficiently to allow him time to move the injured Marine to safety, but before he could attain a covered position himself, he was mortally wounded by small-arms fire. His heroic efforts were instrumental in saving the lives of three Marines and he received the Navy Cross for his actions. He is buried in Fair View Cemetery in Middletown, New Jersey. His name is inscribed on the Vietnam Veterans Memorial in Washington D.C. on Panel 23W, Line 24. Thomas Drew Brindley was born on June 28, 1943 in St. Paul, Minnesota. He loved sports, and played football and hockey with his friends on the Phalen Youth Club teams. He made the varsity hockey team as a sophomore at Johnson High School and played defense in two state high school hockey tournaments. The offer of a hockey scholarship to Colorado College was accepted and he played for three years. Thomas throughly enjoyed his college time, becoming president of the local chapter of Phi Gamma Delta fraternity. He joined the Marine Corps and was accepted into Officer Candidate School. In October of 1967 Thomas bid farewell to his parents, three brothers, his fiancee and friends as he boarded the flight to Vietnam. 2nd Lieutenant Brindley was serving as a Platoon Commander with I Company, 3rd Battalion, 26th Marines, 3rd Marine Division in the Republic of Vietnam. On January 20, 1968, Lieutenant Brindley's unit was maneuvering toward Hill 881, near Khe Sanh, when the lead elements suddenly came under intense small-arms and automatic weapons fire and sustained several casualties. Reacting instantly, he directed a heavy volume of fire against the enemy and moved his second squad to the point of heaviest contact. Despite the tall elephant grass which restricted movement, he effectively deployed and controlled his men, while suppressing the hostile fire sufficiently to enable the casualties to be taken from the area. Quickly shifting his unit to the base of the hill, under covering fire, Lieutenant Brindley lead an aggressive assault against the opposing force which was entrenched in well-fortified positions supported by .50 caliber machine gun emplacements. Ignoring the fire impacting around him, he continuously moved among his men, encouraging them, controlling the squads and directing his unit's return fire. As the Marines reached the crest of the hill and overran the North Vietnamese positions, they again came under intense fire and suffered additional casualties. In an attempt to pinpoint the source of enemy fire, Lt. Brindley, while freely moving throughout the fire-swept area, was struck by hostile fire and fell mortally wounded. His inspiring leadership posthumously earned him the Navy Cross. He is buried in Forest Lawn Memorial Park in Maplewood, Minnesota. His name is inscribed on the Vietnam Veterans Memorial in Washington D.C. on Panel 34E, Line 83. David Harold Brown was born on September 5, 1946 in Saltillo, Tennessee. Sergeant Brown was serving as a Platoon Sergeant with L Company, 3rd Battalion, 26th Marines, 3rd Marine Division. On September 10, 1967, while moving in support of a sister company, southwest of Con Thien on Hill 48, Sergeant Brown's platoon came under devastating enemy rocket, mortar, automatic weapons, small arms, and grenade fire from a numerically superior enemy force. Quickly assessing the situation, he established a defensive position and brought fire to bear on the enemy. With complete disregard for his own safety, he charged the enemy positions, hurling grenades and temporarily disrupting an enemy assault. Upon depleting his grenade supply, he returned through the intense enemy fire and obtained an M-79 grenade launcher and again single-handedly assaulted the enemy positions, once again breaking up their assault and accounting for several enemy killed. Upon completion of this task, he moved among his men, directing their fire and encouraging them until he was mortally wounded. Sergeant Brown was instrumental in stopping the enemy attack and saving numerous Marine lives earning him the Navy Cross. On the day he was killed, he was due to be pulled from the field and rotate home. He had volunteered to return to combat in an attempt to rescue his fellow Marines who had been ambushed. His commanding officer recommended him for the Medal of Honor. Sergeant Brown is buried in Havanna Cemetery near Savannah, Tennessee. His name is inscribed on the Vietnam Veterans Memorial in Washington D.C. on Panel 26E, Line 42. Robert Charles Burke was born on November 7, 1949, in Monticello, Illinois. While still a student at Monticello High School, he enlisted in the U.S. Marine Corps Reserve in Chicago, Illinois, March 17, 1967. Burke was discharged to enlist in the regular Marine Corps on May 16, 1967. Upon completion of recruit training he was transferred to the Marine Corps Base, Camp Pendleton, California. From September 1967 until January 1968, he was a student with the Motor Transport School, Student Company, Schools Battalion. This was followed by duty as a motor vehicle mechanic with Headquarters and Service Company, 5th Military Police Battalion, 5th Marine Division. In February 1968, he was sent to the Republic of Vietnam where he was assigned to I Company, 3rd Battalion, 27th Marines, 1st Marine Division as a Machine Gunner. On May 17, 1968 while on Operation Allen Brook, Company I was approaching a dry river bed with a heavily wooded treeline that bordered the hamlet of Le Nam, when they suddenly came under intense mortar, rocket propelled grenades, automatic weapons and small arms fire from a large, well concealed enemy force which halted the company's advance and wounded several Marines. Private First Class Burke, without hesitation, seized his machine gun and launched a series of one man assaults against the fortified emplacement. As he aggressively maneuvered to the edge of the steep river bank, he delivered accurate suppressive fire upon several enemy bunkers, which enabled his comrades to advance and move the wounded Marines to positions of relative safety. As he continued, he located an opposing automatic weapons emplacement and poured intense fire into the position, killing three North Vietnamese soldiers as they attempted to flee. Private First Class Burke then fearlessly moved from one position to another, quelling the hostile fire until his weapon malfunctioned. Obtaining a casualty's rifle and hand grenades, he advanced further into the midst of the enemy. Observing that a fellow Marine had cleared his malfunctioning machine gun he grasped his weapon and moved into a dangerously exposed area and saturated the hostile treeline until he fell mortally wounded. Pfc. Burke is buried in Monticello Cemetery, in Monticello, Illinois. Robert C. Burke Memorial Park in Monticello, Illinois, his hometown, is named in his honor. His name is inscribed on the Vietnam Veterans Memorial in Washington, D.C. on Panel 61E, Line 24. Karl Gorman Taylor, Sr. was born on July 14, 1939 in Laurel, Maryland. He enlisted in the United States Marine Corps along with his brother, Walter William Taylor, on January 15, 1959. Upon completion of recruit training at Marine Corps Recruit Depot Parris Island, he went on to infantry combat training at Marine Corps Base Camp Lejeune. He went on to serve as a Drill Instructor, an Assistant Police Sergeant, and later, Police Sergeant. He was promoted to sergeant on December 1, 1963. He was transferred to the 3rd Marine Division, in August 1964 and saw a one-year tour of duty as rocket section leader and platoon guide, with G Company, 2nd Battalion, 3rd Marines which included duty in Vietnam. He was reassigned in August 1965 and served as an instructor for the NCO Leadership School until the following November. He was promoted to staff sergeant on September 1, 1966. In February 1968, he returned to the 3rd Marine Division in Vietnam, this time for duty as Platoon Sergeant and Company Gunnery Sergeant of I Company, 3rd Battalion, 26th Marine Regiment. 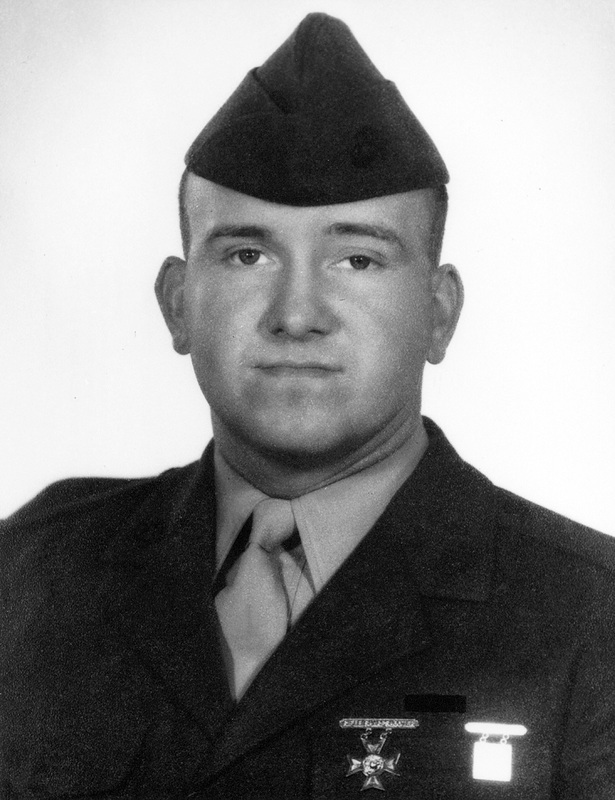 While participating in Operation Meade River on the night of December 8, 1968, Taylor along with another Marine, crawled forward to assist a platoon under fire. With his companion, he then repeatedly maneuvered across an open area to rescue Marines who were too seriously wounded to move by themselves. Upon learning that there were still other seriously wounded men lying in another open area, in proximity to an enemy machine gun position, Taylor, accompanied by four comrades, led his men forward across the fire-swept terrain in an attempt to rescue the Marines. When his group was halted by devastating fire, he directed his companion to return to the company command post; whereupon he took his grenade launcher and, in full view of the enemy, charged across the open rice paddy toward the machine gun position, firing his weapon as he ran. Although wounded several times, he succeeded in reaching the machine gun bunker and silencing the fire from that sector, moments before he was mortally wounded. He was awarded the Medal of Honor posthumously for his heroic actions. On February 16, 1971, President Richard Nixon, in a White House ceremony, presented Staff Sgt. 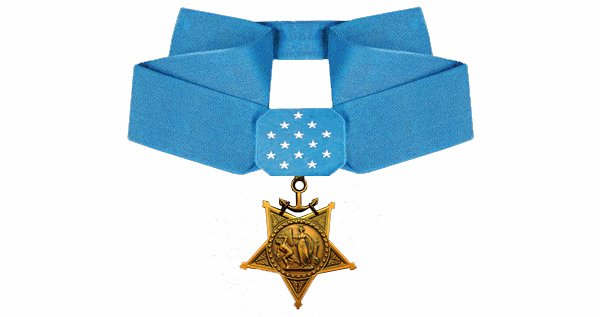 Taylor's Medal of Honor to his family — his wife, daughter, age 8, and two sons, age 7 and 4. Staff Sgt. Taylor is buried in Independence Cemetery at Independence Township, Washington County, Pennsylvania. His name is inscribed on the Vietnam Veterans Memorial in Washington D.C. on Panel 37W, Line 70.